Need Your Love So Bad 7"
Elvis DaCosta was actually already known by the DC fan base as being a guest vocalist during some shows in late ’96. His contribution was to provide backing vocals during The Divine Comedy’s cover of ‘Make It Easy Of Yourself’ and he can be heard on the recording present on the Everybody Knows (Except You) single. Although being of Jamaican origin, Elvis DaCosta grew up in Essex and became a school-friend of The Divine Comedy’s tour manager to be, Dean Kennedy. In 1994, both moved to Jamaica and set up their own band and label ‘Elvis DaCosta And The Imposter’ which released many singles in 1996-1997. Then, Neil was probably asked to return a favour to Elvis to perform some vocals on this single, a cover of Little Willie John’s ‘Need Your Love So Bad’ and featuring another guest, Jamaican singer Delroy Thompson aka Pincher, who released many records in the 80’s. Some parts of the song were recorded in Kingston, Jamaica, at the Black Scorpio studios where Elvis has recorded most of his singles. While other parts were recorded at Westpoint studio in London. Indeed the song features some strings arrangements which were done by Divine Comedy’s member Joby Talbot and played by musicians of the Brunel Ensemble and produced by Jon Jacobs. However, where Neil’s vocals were actually recorded remains unconfirmed. The legend indeed says that Neil really went to Jamaica to record the track, and it remains highly possible that he did since Elvis and Dean were based there… The legend even goes to say that the single went number 1 in Jamaica  and therefore made Neil topping the charts ! The 7” single comes with a yellow label which is more and less centred (see picture bellow), and features some typo: NIEL HANNON (instead of Neil) and ELVISDACOSTA in one word. 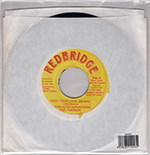 Despite being released mainly in Jamaica, the 7” was also released in UK where it was distributed under the reference RBUK001. Probably thanks to Neil Hannon’s contribution, the single was not only released in Jamaica as a 7” single, but also benefited a European distribution on CD. The CD was released by Redbridge UK, probably an UK branch of the Jamaican label; but it is highly probable that it benefited from help from the people of Setanta Records. Indeed the artwork was edited by Rob Crane who contributed to many Divine Comedy, and other Setanta’s artists, releases at the time; and the single was also available on the Setanta’s only shop at some point, or was distributed in other countries (like in France) along any other Divine Comedy single. The CD has a proper artwork, and features 3 B-sides by Elvis DaCosta including a cover of Bob Dylan’s ‘I Shall Be Released’; but not the instrumental version of the title tracks which remains a vinyl exclusive. Near the centre of the CD we can read: C9717 RB UK CD 001 IFPI L155 and a logo. Muse Magazine #3; but proper charts history would be appreciated.